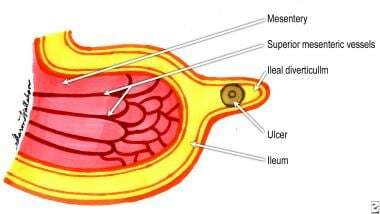 Ileal (Meckel) diverticula and other remnants of yolk stalk. Section of ileum and diverticulum with ulcer. 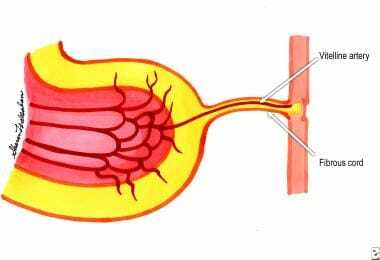 Pluripotential cells line the omphalomesenteric duct; thus, gastric, colonic, duodenal, and pancreatic mucosa may be present. 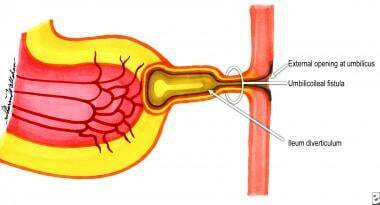 The diverticulum may or may not be attached to the umbilicus with a fibrous cord. Autopsy records show that Meckel diverticulum occurs in about 2% of the general population. The male-to-female ratio is 3:1 for patients with symptomatic diverticula, but it is 1:1 for patients with asymptomatic diverticula. Diverticulum connected to umbilicus by fibrous cord. 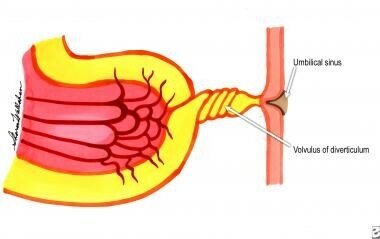 Umbilicoileal fistula resulting from persistence of entire intra-abdominal portion of yolk stalk. Umbilical sinus resulting from persistence of yolk stalk near umbilicus. 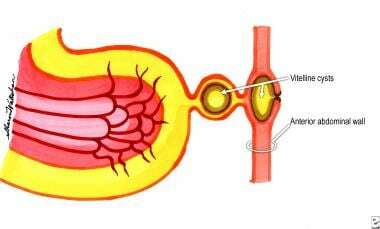 Vitelline cysts at umbilicus and in fibrous remnant of yolk stalk. Yolk stalk has persisted as fibrous cord connecting ileum with umbilicus. Persistent vitelline artery extends along fibrous cord to umbilicus. Hemorrhage is the most common complication of Meckel diverticulum, accounting for about 20-30% of all complications. It is more common in children younger than 2 years and in males. The patient complains of passing bright red blood in the stools. Bleeding may range from minimal, recurrent episodes of hematochezia to massive, shock-producing hemorrhage. Hemorrhage from a Meckel diverticulum may or may not be associated with abdominal pain or tenderness. Patients may also present with weakness and anemia and may have a history of self-limiting episodes of intestinal bleeding. The gastric mucosa found in the diverticulum (see the image below) may form a chronic ulcer and may also damage the adjacent ileal mucosa because of acid production. Ectopic gastric mucosa is found in about 50% of all Meckel diverticula; in bleeding Meckel diverticula, the incidence increases to 75%. Perforation may occur, and the patient then presents with an acute abdomen, often associated with air under the diaphragm, best visualized on an erect chest radiograph. Specimen of Meckel diverticulum (mucosal surface) showing gastric mucosa. When a patient presents with painless lower GI bleeding, Meckel diverticulum should always be suspected. Panendoscopy helps exclude disease in the upper GI and colorectal regions, the two most common sites of GI bleeding. 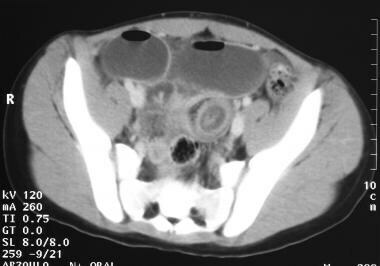 Preoperative CT scan of abdomen in 14-year-old child, showing intestinal obstruction due to Meckel diverticulum. Various mechanisms of intestinal obstruction occur with Meckel diverticulum as a causative factor. Because the omphalomesenteric duct may be attached to the abdominal wall by a fibrotic band, a volvulus of the small bowel around the band may occur. The diverticulum may also form the lead point of an intussusception and cause obstruction. Infrequently, a tumor arising in the wall of the diverticulum may form the lead point for intussusception. When incarcerated in an inguinal hernia, a Meckel diverticulum is called a Littré hernia. Patients with intestinal obstruction due to Meckel diverticulum present with abdominal pain, vomiting, and obstipation. Radiography of the abdomen may indicate an ileus or frank stepladder air-fluid levels, as observed in dynamic intestinal obstruction. In cases of intussusception, patients may also present with a palpable lump in the lower abdomen and currant jelly stools. This condition develops in approximately 10-20% of patients with symptomatic Meckel diverticulum, occurring more often in the elderly population. Patients may present with symptoms of intermittent, crampy abdominal pain and tenderness in the periumbilical area. Perforation of the inflamed diverticulum leads to peritonitis. Stasis in the diverticulum, especially in one with a narrow neck, causes inflammation and secondary infection leading to diverticulitis. 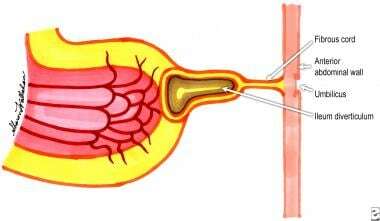 Diverticular inflammation can lead to adhesions, which cause intestinal obstruction. These occur in up to 10% of patients and consist of fistulas, sinuses, cysts, and fibrous bands between the diverticulum and the umbilicus. A patient may present with a chronic discharging umbilical sinus superimposed by infection or excoriation of periumbilical skin. There may be a history of recurrent infection, sinus healing, or abdominal-wall abscess formation. When a fistula is present, intestinal mucosa may be identified on the skin. Cannulation and injection with radiographic contrast help to delineate the entire tract and aid in planning a surgical approach for cure. A discharging sinus should be approached surgically with a view toward correction. Exploratory laparotomy may be required. 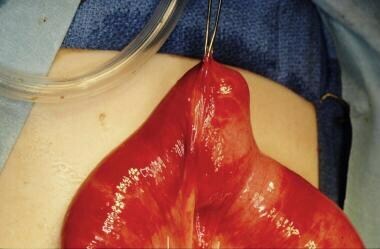 When found at laparotomy, a fibrous band should be excised because of the risk of internal herniation and volvulus. Other reported complications in Meckel diverticulum are vesicodiverticular fistulas, "daughter" diverticula (formation of a diverticulum within a Meckel diverticulum), and formation of stones and phytobezoar in the Meckel diverticulum. A diagnosis of symptomatic or complicated Meckel diverticulum is difficult to confirm on the basis of traditional history, physical examination, and laboratory testing. It is always considered as a differential diagnosis in cases of intestinal obstruction and intestinal hemorrhage. Painless, profuse hematochezia, especially in a child, should alert a clinician to the possibility of such a diagnosis and should prompt further investigation. Thus, in a child, the differential diagnosis for right-lower-quadrant pain includes appendicitis, acute mesenteric lymphadenitis, intussusception, or Meckel diverticulitis. 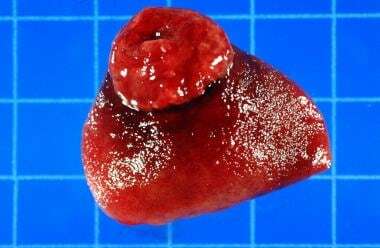 In an adult, Meckel diverticulum should be entertained in the diagnosis for lower GI bleeding, which would also include angiodysplasias, malignancy, arteriovenous malformations, and other causes. Laparoscopy and laparotomy are the most frequent means by which an incidental diverticulum is found. An upper GI series with small-bowel follow-through also detects a diverticulum. The diverticulum appears as a smooth, white, globular shadow on the antimesenteric border of the ileum, approximately 50 cm proximal to the ileocecal valve. Diagnosis of a bleeding Meckel diverticulum is established by means of technetium-99m (99mTc) pertechnetate radioisotope scanning. This isotope, administered intravenously, is readily taken up by the gastric mucosa. Reportedly, 1.8 cm2 of ectopic gastric mucosa in Meckel diverticulum is required for a positive result. Pentagastrin, which is known to increase the acid production of ectopic gastric mucosa, enhances radioisotope uptake by the cells. Using a histamine-2 (H2) receptor blocker with pentagastrin provides a synergistic effect, in that it blocks intraluminal release and promotes retention of the isotope. The value of 99mTc pertechnate scanning is more specific in children. The incidence of false-negative results is high, especially in adults; therefore, a negative scan finding does not exclude a Meckel diverticulum. False-positive results are observed in patients with intussusception, volvulus, obstruction of the small intestine, acute appendicitis, carcinoid of the appendix, or carcinoma of the caecum. The use of pentagastrin and an H2 receptor blocker helps minimize the number of false-negative results. Approximately 30 images may be required (at 1-minute intervals) to demonstrate activity in the terminal ileum. Superior mesenteric angiography may be helpful in patients presenting with acute GI bleeding and is effective when blood loss exceeds 0.5 mL/min. In 1976, Soltero and Bill reported that the lifetime risk of complications from Meckel diverticulum was 4.2% and that the risk decreased with age. Their data indicated that 800 asymptomatic diverticula would have to be removed to save the life of one patient. On that basis, they opposed surgical excision. Miltiadis et al stated that resection of incidentally found Meckel diverticulum protected patients from future surgery caused by complications of Meckel diverticulum. This strategy could help reduce morbidity and mortality, especially in elderly patients. Cullen et al reported that prophylactic diverticulectomy is warranted to eliminate the possibility of future deaths. As a result, they advocated diverticulectomy for asymptomatic disease even in the older age group. Removal of a healthy diverticulum in the presence of peritonitis, Crohn disease, ulcerative colitis, or any other complication that would militate against resection is not advised. Intraoperative photograph of Meckel diverticulum. All procedures may be carried out either by handsewn technique or by stapling, depending on the preference of the surgeon. Stapling enables faster resection of a Meckel diverticulum without the need to open the bowel's lumen, thus avoiding potential septic and postoperative complications. Meckel diverticulum, which fits well into the stapling device, is easy to remove, and removal has a low complication rate, especially when the diverticulum was found incidentally. How best to manage a Meckel diverticulum in an asymptomatic patient is controversial. The risk of postoperative complications following excision of an incidental diverticulum has been reported to be as high as 8%. Symptomatic patients have a 10-12% incidence of early postoperative complications, such as ileus, suture-line or anastomotic leakage, intra-abdominal abscess, and pulmonary embolism. Late postoperative complications occur in 6-8% of patients and primarily consist of small-bowel obstruction due to intestinal adhesions. The reported mortality for surgery in symptomatic patients is 2-5%. With incidental diverticulectomy for asymptomatic disease, the morbidity is 2%, the late postoperative complication rate is 2%, and the mortality is 1%. Francis A, Kantarovich D, Khoshnam N, Alazraki AL, Patel B, Shehata BM. Pediatric Meckel's Diverticulum: Report of 208 Cases and Review of the Literature. Fetal Pediatr Pathol. 2016. 35 (3):199-206. [Medline]. Dumper J, Mackenzie S, Mitchell P, Sutherland F, Quan ML, Mew D. Complications of Meckel's diverticula in adults. Can J Surg. 2006 Oct. 49(5):353-7. [Medline]. Cullen JJ, Kelly KA, Moir CR, Hodge DO, Zinsmeister AR, Melton LJ 3rd. Surgical management of Meckel's diverticulum. An epidemiologic, population-based study. Ann Surg. 1994 Oct. 220(4):564-8; discussion 568-9. [Medline]. Karadeniz Cakmak G, Emre AU, Tascilar O, Bektas S, Ucan BH, Irkorucu O, et al. Lipoma within inverted Meckel's diverticulum as a cause of recurrent partial intestinal obstruction and hemorrhage: a case report and review of literature. World J Gastroenterol. 2007 Feb 21. 13(7):1141-3. [Medline]. Thirunavukarasu P, Sathaiah M, Sukumar S, Bartels CJ, Zeh H 3rd, Lee KK, et al. Meckel's diverticulum--a high-risk region for malignancy in the ileum. Insights from a population-based epidemiological study and implications in surgical management. Ann Surg. 2011 Feb. 253(2):223-30. [Medline]. [Guideline] Spottswood SE, Pfluger T, Bartold SP, Brandon D, Burchell N, Delbeke D, et al. SNMMI and EANM practice guideline for meckel diverticulum scintigraphy 2.0. J Nucl Med Technol. 2014 Sep. 42(3):163-9. [Medline]. [Full Text]. Qi S, Huang H, Wei D, Lv C, Yang Y. Diagnosis and minimally invasive surgical treatment of bleeding Meckel's diverticulum in children using double-balloon enteroscopy. J Pediatr Surg. 2015 Sep. 50 (9):1610-2. [Medline]. McKay R. High incidence of symptomatic Meckel's diverticulum in patients less than fifty years of age: an indication for resection. Am Surg. 2007 Mar. 73 (3):271-5. [Medline]. Soltero MJ, Bill AH. The natural history of Meckel's Diverticulum and its relation to incidental removal. A study of 202 cases of diseased Meckel's Diverticulum found in King County, Washington, over a fifteen year period. Am J Surg. 1976 Aug. 132(2):168-73. [Medline]. Gezer HÖ, Temiz A, İnce E, Ezer SS, Hasbay B, Hiçsönmez A. Meckel diverticulum in children: Evaluation of macroscopic appearance for guidance in subsequent surgery. J Pediatr Surg. 2016 Jul. 51 (7):1177-80. [Medline]. Hosn MA, Lakis M, Faraj W, Khoury G, Diba S. Laparoscopic approach to symptomatic meckel diverticulum in adults. JSLS. 2014 Oct-Dec. 18 (4):[Medline]. [Full Text]. Alemayehu H, Stringel G, Lo IJ, Golden J, Pandya S, McBride W, et al. Laparoscopy and complicated meckel diverticulum in children. JSLS. 2014 Jul-Sep. 18 (3):[Medline]. [Full Text]. Ruscher KA, Fisher JN, Hughes CD, Neff S, Lerer TJ, Hight DW, et al. National trends in the surgical management of Meckel's diverticulum. J Pediatr Surg. 2011 May. 46 (5):893-6. [Medline]. Fast Five Quiz: How Much Do You Know About Diverticulitis?